This feature was suggest to us at a recent mathematics conference. If you have a good idea for how we can improve our products, you can always send it to us at info@efofex.com. We have added the ability to select the number of decimal places generated with our continuous data generators. If you are not using the data generators in FX Stat and the statistics tool of FX Draw, you really should be. They give you quick and simple access to a large number of distributions. These four buttons give you access to the selection of generators. 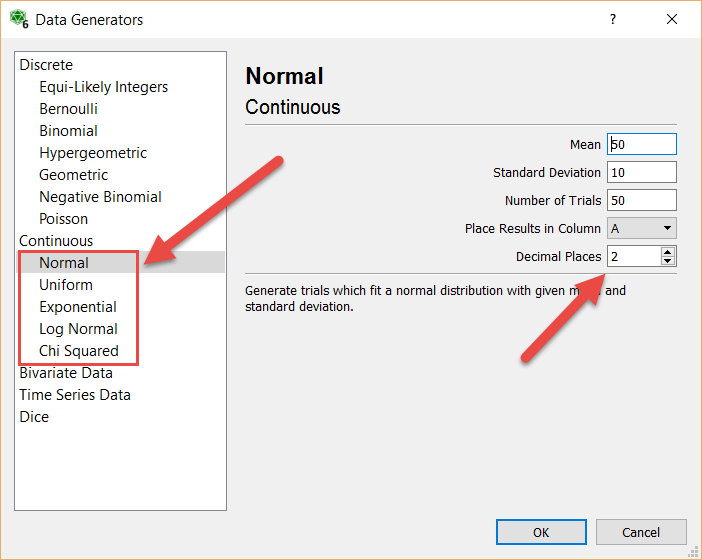 There are fifteen generators in all including a very handy bivariate data generator that allows you to enter the regression formula you would like to fit and a target correlation coefficient. Once you have selected your parameters, the generator generates random values from the selected distribution. A new decimal places option has been added to the continuous distributions. You can select anywhere from 8 down to -2 decimal places (-2 rounds to the nearest 100).